New innovations in dentistry make it possible for dentists to preserve natural teeth for longer than before. Unfortunately, despite these advancements, 35 million Americans do not have any of their real teeth remaining. In the past, traditional dentures were the only option to replace missing teeth; however, now you have another choice. Many people prefer a solution that closely looks and feels natural. Dental implants are the reliable treatment for full mouth replacement in Ponte Vedra Beach. We have the solutions you need to rebuild your smile. Looks natural using all-ceramic material. Regain as much as 70% of your biting force to enjoy your favorite foods. 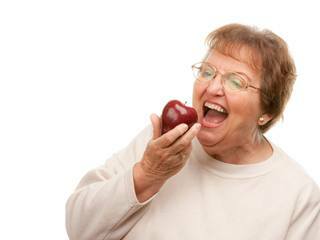 Traditional dentures rely on suction or an adhesive to hold them to your gum tissue. 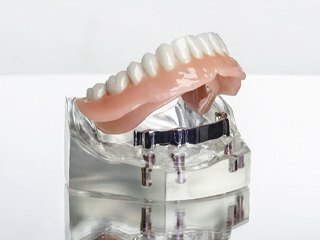 Implant-retained dentures use the security of the implant posts. On average, 2 to 6 posts anchor your denture to your jawbone, so you will never need to worry about slipping or irritation. Special fixtures are placed on each post to attach your custom-made denture. All-on-4 is another type of implant-retained denture. It uses 4 implant posts to support the custom-made denture. Often, we can fit you with a temporary denture the same day as your placement surgery, so you do not need to go without your teeth. After you have healed, your final denture is attached to your posts. 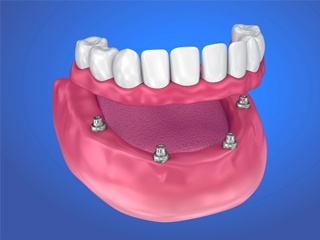 If you are tired of living with the irritation and hassle of traditional dentures, you may be a candidate for full mouth replacement using dental implants. Generally, if you do not have any remaining teeth, you can benefit from them; however, you will need a consultation to ensure they are right for you. We conduct a visual examination and take a CT scan to assess your oral health and structures. This is also necessary for us to pinpoint the ideal location for your implant posts. If your jawbone has adequate density and you have minimal risk factors for implant failure, you can complete your smile with dental implants. If you do not have any remaining teeth, you can restore your smile with full mouth replacement using dental implants. Contact Ponte Vedra Complete Dentistry today to schedule your consultation for a healthy, functional smile.